Probably one of the most fascinating people among my Twitter followers, I am eagerly looking forward to is television anchorman and author Jim Brown’s latest book, Boom. Click here to view the trailer for Boom, which you can also receive a free copy. 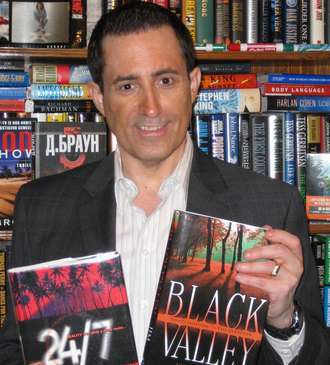 Jim’s first novel 24/7 has been optioned for film to Michael Garrett of Paramount Pictures, and film rights for his last book, Black Valley, have gone to acclaimed writer and producer Stephen Susco, the screenwriter of The Grudge and The Grudge II. Jim Brown is a critically acclaimed author, as well as an award-winning journalist and three-time winner of the Associated Press Best Newscast Award. He is currently an anchor with FOX… but he’s also worked with NBC, ABC, and CBS. Jim has broadcast live for CNN, been featured in a BBC documentary, and an Oregon State University educational film, as well as reported from inside the Oregon State Penitentiary for the execution of Jerry Lee Moore. As a crime reporter Jim has covered such breaking news as the Springfield, Oregon school shooting, the Atlanta Child Killings, the Stocking Strangler, as well as countless other criminal and court cases. As a result he has been threatened and even shot at. But he always got the story. He’s chased tornados in Georgia, covered hurricanes in Florida… and reported mud slides, floods and wildfires on both coasts of the United States. As a political reporter Jim has interviewed President Reagan, Bush, Clinton and Carter. As well as Hillary Clinton, Al Gore, and Jessie Jackson . . . just to name a few. In addition to being a reporter, Jim has worked every job there is in the newsroom… including Television News Director. Jim’s wife (Kathryn Herr) is an anchor/​reporter… and they spent close to ten years co-anchoring together. In addition to his passion for news Jim is also a prolific writer. He’s written a newspaper column for three years and is also well-known suspense novelist, who’s published his first two books (24/​7 and Black Valley) with Random House. Jim has been featured in both Writer’s Digest Magazine and the Writer’s Digest Guide to Literary Agents.